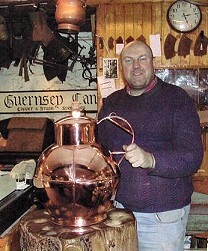 The cans on offer are totally hand-made to the highest quality by Guernsey coppersmith, Trevor Rogers-Davis (seen manufacturing can at workshop in picture on right), who has been crafting these cans by traditional methods for over 35 years using hand tools up to 200 years old. 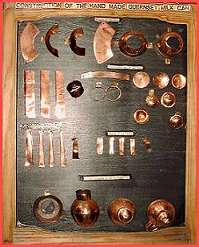 The component parts of the can (body sections, base, handle and lid) (see picture left) are all cut and skillfully manufactured from sheet copper. 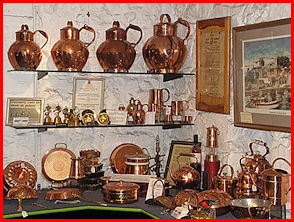 The copper can is tinned on the inside (so it may hold liquid without taint). 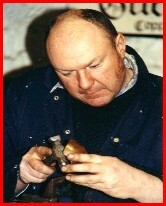 The cans are tested to ensure there are no leaks and then polished to a lustrous finish. Trevor produces these cans in 15 sizes from a half-pint (0.28 litres) to a 40 pint (22.73 litres). 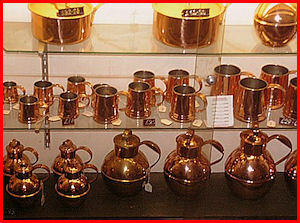 He is the last working coppersmith in the Channel Islands making these copper cans and producing other items in copper. 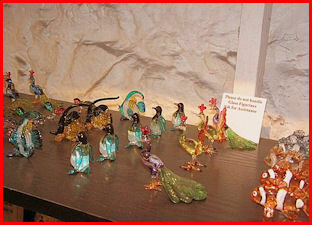 Making a can is a time consuming matter as can be appreciated from the componant parts shown in the above picture. There is no quick way around the process. 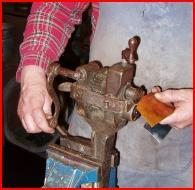 The copper sheet must be cut accurately and then carefully beaten into shape. 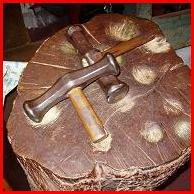 Seen below are some of the antique tools that have been used for many generations of can makers and are still used today. Only a skilled craftsman with a keen eye and many years' experience is able to ensure that the cans are produced in their correct shape and that the lids fit with precision. When all the soldering of the seams has been performed, the insides of the can and lid are tinned and leak tested before being taken into a clean environment to be highly polished. Only when Trevor is completely satisfied with the final product will the can receive the Guernsey Cans (Coppersmiths) stamp on its base and the year of manufacture added together with Trevor's initials. Cans made by Guernsey Cans (Coppersmiths) project the image of tradition, craftsmanship and quality reflecting their 1000 year history. A display of these cans, whether just a single unit or in a series of sizes, will enhance any room in the home, office, restaurant or bar.